This cake serving tray is everyone's dream. It is designed to store, transport and serve cakes or desserts for any occasion. It will accommodate a 8" round cake. It has a handle for comfort carrying and has tight clasping latches to hold securely the lid to the base for the cake to keep fresh. It can be used as a tray by removing the lid and placing it on the table. 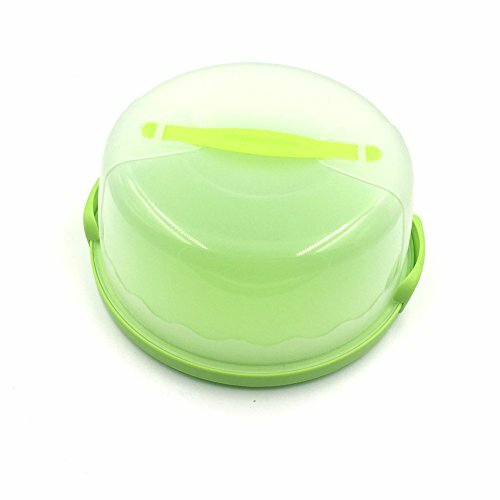 Portable cake carrier features a durable and light base & semi-transparent top,and top features with 1 sturdy handle that flat inside lid, be convenient to carry. Size:7.8" top diameter x 9.8" bottom diameter x 3.9"H.Perfect for transporting and storing pies, cheesecakes and all other baked treats too! SAFE: BPA-free to ensure your stored foods are kept healthy, fresh & safe for your friends & family to enjoy! View More In Cake Carriers.